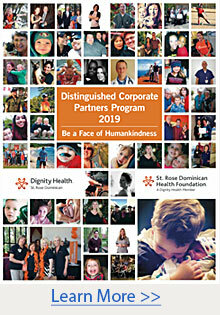 As a not-for-profit, faith-based health care ministry, Dignity Health - St. Rose Dominican recognizes the tremendous success when individuals, companies and organizations come together to influence a common good: the health of our community. Proceeds from each of these events will directly support critical - often life-saving -services. For example, donations through the Children’s Miracle Network programs help to fund pediatric emergency care, neonatal and pediatric intensive care and life-enhancing community outreach initiatives that support healthy, happy and meaningful lives.